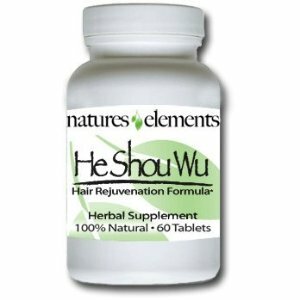 Powerful Chinese herb He Shou Wu stimulates hair growth and reverses gray hair. This potent product is now available from Natures Elements as a powerful 12:1 extract. He Shou Wu works by nourishing the liver and kidneys, providing a better blood flow to the scalp thus creating healthier hair. This amazing herb promotes more hair and less grays. For centuries the Chinese have known about this natural herbal formulas ability to bring hair back to its original natural color. Now this time tested Chinese herb, that is extracted from the ancient medicinal herb of the nutrient rich root of the wild Eastern Rose Plant, is available in 2 easy to swallow tablets. When buying He Shou Wu, there are 4 things to know. First of which is the potency of the product. Natures Elements puts a strong powerful dose in these 2 tablets because they use a potent 12:1 extract which is not found elsewhere. Typical powders that are not extracted and will not provide a concentrated amount, therefore the desired results will not be achieved. Be sure to know whether each bottle provides a complete one month supply. Some companies try to persuade buyers with lower prices, but don't provide the user with enough tablets to complete a full month of usage. Also, know what's in it. If label reads Proprietary Blend or no information on how many milligrams of He Shou Wu are actually in the dosage that likely means there is not much in it at all. Natures Elements clearly states that each dosage contains 1,000 mg of 12:1 extract. The 12:1 extract is the final point to consider. This extract ratio determines the strength of the He Shou Wu provided, and the higher the extract ratio, the better. Bottom line is He Shou Wu is a tonic worthy of taking for the rest of one's life. Not only does it provide the desired benefit of reversing gray hair and stimulating hair growth but it has a vast array of other healthy effects. He Shou Wu has been known to relieve lower back and knee pains, provide a boost for the immune system, and most importantly, it is thought of as the most amazing longevity herb of all. Natures Elements exclusively offers this product. They also provide their customers with the option for auto-ship which provides steep discounts and the added convenience of automatic delivery. Read more about He Shou Wu and all the product has to offer by clicking here.